It's safe to say that outside Shankly's family nobody knew Bill Shankly as well as Bob Paisley. "In my place you have a man, who, like me, is basically honest. Without having basic honesty you are nothing. I hope that Liverpool will be successful for a long time to come and that Bob Paisley and his staff will do a great job. He's been a very loyal man to me. When I decided to go I said to the chairman he should be very careful about bringing somebody in from outside the club, because there is a very capable staff inside who, over a 14-year period, have laid down a system and pattern of playing which some Fancy Dan might come along and break up with fancy phrases. 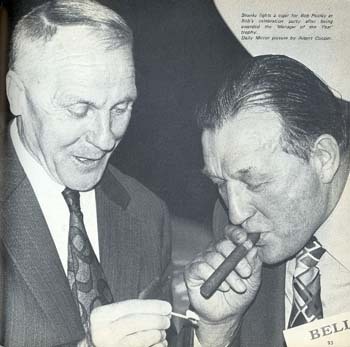 Bob Paisley, of course, is the number one man - so I recommended him." 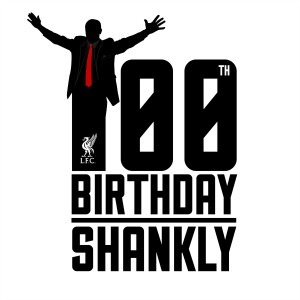 This is an insightful tribute from Shankly's right hand man and eventual successor. "Bob and I never had any rows. We didn’t have any time for that. You see he was a real loner. He didn't knock about with anyone. I'd go round and see Nessie to try and find out what was up, and she'd beg me to persuade him to change his mind. She was frightened of him lying round the house with nothing to do. I did my best, but he'd made his mind up. If I was pushed to give an opinion about why he went, I'd say maybe he was frightened of having another lean spell. He'd just won the cup and I think he'd made up his mind to go out at the top like a class boxer. He was a boxer at heart. And his retirement didn’t work. He went to places like Tranmere to advise, but he was on the outside of things and that wasn’t good enough for Bill. He needed to be at the centre. Without doubt he made a big mistake going so soon. He should have known it wouldn’t do him any good, and of course it all got a bit too much for us at Anfield. He started going to games and being a bit critical of things, saying he wouldn’t have done this and that if he’d been there. I’d say to him: 'Do what you want, Bill. If you want to come training, come training'. I took a risk and it all got too much for him. He’d come down to Melwood and the lads would be a bit overawed by his presence. I didn’t mind at first, but it got ridiculous. Sadly, for the benefit of the club, he had to stay away. When Bill arrived he upset a few people because he was a very straightforward man. But he knew his business. He was a great manager. But, as I say, not everyone liked his style, especially the directors. You see, in the late 50’s we were a happy-go-lucky, slap-happy crowd. The height of the directors’ ambitions was to get into the First Division and they’d have been quite happy just to get there and go along three or four places off the bottom. But Bill was determined to change things and so was I. We talked a lot and made our plans. We got on like a house on fire. You see I always gave Bill a straight answer and he liked that. He’d always ask my opinion and respect it because I was straight with him. We never once had an argument. Bill always accepted criticism from people he respected. He was good at his job and he expected other people to be the same. So we both decided in the early days that Liverpool were going places under us. And Bill would tell the board this, and his ambition would frighten them. They didn’t want the boat rocked and they didn’t know how to handle Bill. But Bill was so dedicated to football and Liverpool that they just had to give him a chance. Football vas the only thing he’d seen. He couldn’t relax. It was all football, football, football. The board would try and knock down some of his ideas, but he’d convince them they were wrong. He always got his own way and when he got the success they had to leave him alone. The players loved him of course. He was a real rabbit and all the funny stories and the jokes were right up their street. He’d have them in stitches but there was always a serious message there and that’s how he got it across. And of course he was a great psychologist. He’d tell the lads how pathetic the opposition were and 90 minutes later tell them they’d beaten the best side in the country, and they’d take it week after week because of his personality. That was what made him such a great manager. He was a great motivator. Sometimes it would backfire on you mind. You see he used to encourage all sorts of lads to come down to Anfield and receive attention for injuries. And I’ll never forget one day I was in my room and I heard Bill in the corridor telling this lad: 'Ah, that’s no problem, son, Bobby Paisley will sort you out. He’s the greatest trainer in the world. He can fix anything. There’s his room, there. Tell him I sent you'. And then a few moments later this poor young fella wheels himself in a wheelchair. It was so sad. I couldn’t do anything for him. But that was Bill. He’d think just by telling people something it would make them believe in themselves and they’d be alright and it rubbed off on lots on them and made them better people. He had a great knowledge of the body and it stood me in great stead as a trainer. Training was very planned. We’d discuss it every morning and then put our plans in effect right to the last detail. It was science under Bill, training. If I have one criticism of Bill it was that he didn’t break up the great team of the 60’s earlier. He was content with what he’d done and kept faith with the players. He was a very loyal man, but I was keener to get back to winning things again. But I picked up a lot of knowledge from Bill that stood me in great stead as manager. I’d pick up stuff out and store it away. You had to learn from Bill. He was football crazy, and I mean crazy. He was fanatical, like no-one else I met. If I had to sum up Bill’s effect at Anfield it’s quite simply that he got the whole thing going. We were nothing before he came, and look at us now. He’s very sadly missed.